Skoda is known for their astonishing advancements in environmentally friendly logistic fleet. The company recently unveiled 4 new CNG-powered trucks for its factory in Mlada Boleslav. With CNG thrusting the wheels, reduction in transportation cost and carbon emission will be significant. Skoda has announced the use of `Gigaliners’ in future to further reduce the emissions by 200 tons per year. 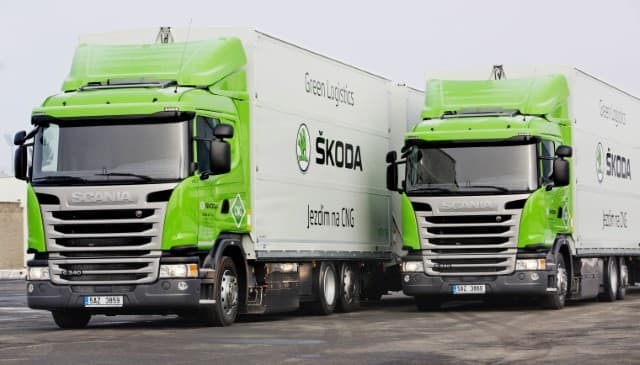 Under a 2 month trial period, three of the compressed natural gas lorries have been put into full-time service at Skoda HQ in the Czech Republic, while another completes a 120-km (75-mi) journey from the factory to Stráž nad Nisou 12 times per week. Doing so it saves 16 tonnes of CO2 compared to a vehicle with a diesel engine. Performance of these lorries were quite impressive with reduced emissions by 30 percent. Nitric oxide (NOx) emissions are 80 to 90 per cent lower, while carbon monoxide emissions (CO) are reduced by a total of 90 per cent. On top of it, the trucks consume only 50 kg of CNG per 100 km with lesser particulate emissions by 95 percent. The 25-m (82-ft) lorries are able to carry 150 m3 (5,297 cu.ft) of goods, 50 percent more than a regular truck. That allows the drivers to make 18 fewer trips along their 292-km (181-mi) route every week. Alongside CNG, Skoda is also planning to utilize Solar and electric power as a part of their ‘Green Future’ strategy. Currently, as a part of a pilot project, all production related transportations are carried out by battery powered tractors which are also equipped with solar panels. Lithium ion batteries are charged by solar power while the vehicle is in motion. 18 such tractors are in use at ŠKODA’s plant and if the trial gives satisfactory results the number will increase to cover most of the transportation needs. Its was a good initiative by team skoda.CNG powered trucks with great efficiency will attract buyers if in case it was for production rather than pilot lot.